Hearing Las Vegas and churches in the same sentence bring to mind bright chapels and shotgun weddings being done by Elvis impersonators! But Las Vegas appears to have cornered the market when it comes to religion as well. From Catholicism through to Sikhism, thousands of people turn up weekly to worship in the various churches, synagogues and mosques throughout the city. Some of the biggest communities are known as Mega churches – with more than 2000 members. Calvary chapel opened its doors in the mid-1980’s and originally helped in a preschool. Since then it has grown to cover 20 acres of land, and at its various services, it draws upward of 2500 members each week. On the property, you will also find a school ranging from pre-school right through to 12th grade. Established back in 1964, Shadow Hill Baptist Church was started in a trailer with about 30 members per service. It has since grown to include on its ground a worship centre, a children’s building and a fellowship centre. The membership of Shadow Hill Baptist Church stands at just under 4000, and over 3500 can be found attending one of their services each Sunday. 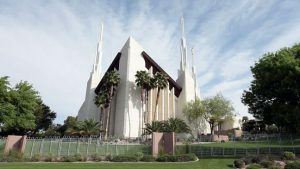 Canyon Ridge Christian Church is one of the largest congregations in Las Vegas, drawing nearly 6000 members over a weekend. It is a nondenominational church, meaning it accepts people of any Christian denomination, and it offers many programmes for both children and adults. The Church at South Las Vegas was established in 2002 with a few dozen members and moved location a number of times before settling. It draws on average 3000 members every weekend and adds around 1000 more by streaming its services online. This is also a respresentation of how Sunday mass is utlising the tools of the digital age.